ZURICH, Feb. 14, 2019 /PRNewswire/ -- Jet Aviation announced today that it has added a second Boeing B737 (BBJ1) to its fleet of managed aircraft in Europe, the Middle East and Africa (EMEA). 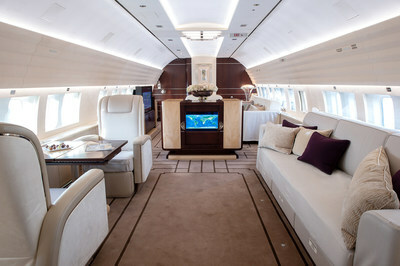 The BBJ1 is based in Western Europe and is available for charter service. Managed by Jet Aviation's aircraft management and charter business in Malta, the Boeing BBJ1 has been added to the company's Maltese air operator's certificate (AOC). "We are thrilled to expand our fleet for charter customers," says Claudio Peer, senior director Aircraft Management & Charter Sales, EMEA & Asia. "This airliner-type private jet is ideally suited to customers who enjoy premium comfort and the latest technology for long-range flights." The long-range BBJ1 has a range of up to 9,260km and offers space for up to 11 passengers to fly in comfort. Furnished with a luxurious VIP interior, the aircraft features a master bedroom and ensuite bathroom with shower, separate guest and crew lavatories, and two side-facing divans that convert to single berths. The aircraft's elegant cabin interior is characterized by clean lines, neutral tones and leather seating, and boasts all the essential passenger amenities, including a high-end entertainment system. "Customers appreciate charter options to meet their varying needs," said Norbert Ehrich, vice president for Flight Services EMEA and Asia. "A larger jet provides greater space and comfort for longer flights and trips with more passengers. It is our pleasure to offer clients more choice for long-range charter trips." Jet Aviation Business Jets, an Air Carrier Certificate holder in Malta, Germany and Switzerland, is headquartered in Zurich, Switzerland, and responsible for delivering the company's aircraft management and charter services in EMEA and Asia. As one of the largest aircraft management, flight support and charter companies in the world, Jet Aviation currently manages and supports more than 150 aircraft from Cologne, Germany; Dubai, United Arab Emirates; Hong Kong; Malta; and Zurich, Switzerland. The company's Aircraft Management services provide comprehensive turn-key solutions to owners and operators, while its Flight Support Solutions offer a more personalized program tailored to meet individual customer requests. Jet Aviation, a wholly owned subsidiary of General Dynamics (NYSE: GD), was founded in Switzerland in 1967 and is one of the leading business aviation services companies in the world. More than 4,800 employees cater to client needs from close to 50 facilities throughout Europe, the Middle East, Asia, North America and the Caribbean. The company provides maintenance, completions and refurbishment, engineering, FBO and fuel services, along with aircraft management, charter services and personnel services. Jet Aviation's European and U.S. aircraft management and charter divisions jointly manage a fleet of some 300 aircraft. Please visit www.jetaviation.com and follow us on twitter: http://twitter.com/jetaviation.